Cylie and Alicia visited the designers of Skobi school shoes earlier this year. Jason and Sophie McLellan are Queensland podiatrists who saw the gap in the school shoe market. This gap was school shoes that last, shoes that have features podiatrists look out for in kids shoes and most of all, shoes that fit well and keep kids active. After this, they decided Kingston Foot Clinic would be one of the two stockists in Victoria of Skobi shoes. 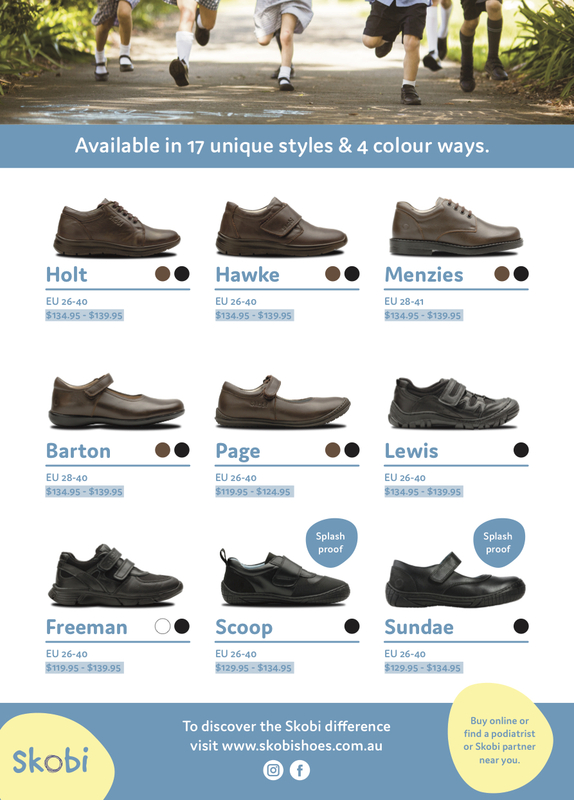 We have most of the shoes in fitment pairs. This means, we can fit your child and order them for you or give you the code to order the shoes. The shoes will then be posted to you at no cost within a few days, direct from the factory. That way you get to avoid the long lines at the shops and your kids get a surprize parcel in the mail soon after. You can bring your child in for fitting on any days we are open. © 2013 Kingston Foot Clinic. All rights reserved.